There’s going to be a lot of changes and additions coming up, so instead of dumping a whole bunch of information in one potentially-overwhelming go, we’re going to introduce a brief outline early on of what’s to come. Everyone will probably have some questions before then too, so the extra few days will give us more time to track down and compile those answers. These changes to how we’re giving players access to Supports were born from listening to your feedback. Marvel Puzzle Quest is a living, breathing game, one that grows and changes in response to the people playing it, and this update is no exception. How players engage with Support Circuit and what you’re saying will definitely inform how we adjust or revamp it going forward. So, please continue to share your thoughts - we’ll listen closely. We want to give players a way to earn Supports on a more consistent basis. With that goal in mind, we’re introducing the new weekly Support Circuit event. This event is designed for players who want to improve and continue to build their collection of Supports. There are 4 different Support Circuit events, each featuring a different combination of Minions and enemies. With more Supports being added to the game, we want to include them in the Support store, while still making sure players have a way to earn the Support they want. To do this, we’re revamping the Support store to focus on 16 Supports, and rotating those 16 Supports every 5 weeks. By limiting the number of Supports in the store, we hope players can earn the Support they want much easier than before. In fact, in some cases players may only need to open half as many tokens to get a specific Support compared to before! Don’t worry though. If you find yourself wanting to pull from the entire catalog of Supports, there will still be a Supports store containing every Support released that becomes available prior to the next rotation. Please note that Support Tokens for the old Store are unable to be converted into Tokens for the new Store. Also, Support Tokens earned during the current Versus Season will only work for the old Supports Store. In addition to giving out more tokens to the Support Store, and letting players focus on the Support they want, we want to give players a chance to more easily get higher Rank Supports. So, as well as changing the Support Store contents, we’ve adjusted the odds of each token as well. While the Master Support Tokens now give out fewer Rank 4 and 5 Supports, we’re awarding more of them through the Support Circuit Event and Vault than before, and with the addition of those Ranks to the Beginner and Advanced Support Tokens, we believe this makes it easier to earn these powerful supports than ever before. As a result of increasing the ability to target specific Supports, that will inevitably mean players receive more duplicates than before. 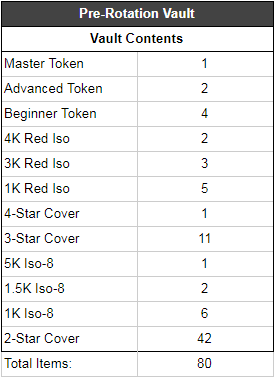 In order to balance that, we’ll be lowering the amount of Red Iso-8 rewarded from earning a duplicate Supports. Between each 4-week block of the Support Circuit Event and before the next Supports Store rotation occurs, we’ll give players access to a different Support Store and new Supports-focused Vault. This store has the same odds and structure as the regular Store listed above, but instead contains every released Support. To go along with this, there will also be a discounted, 80 item Vault. Similar to the Off-Season Heroic Store, this Vault offers no Daily Deal, but each pull will be discounted. With each Support we’ve released in the past, we’ve offered two different bundles. While we won’t be making any changes to the 4800 Hero Points offer, we’ll be making a few tweaks to the 250 Command Point bundle.